I thought my brother Jeff was crazy when he told me he was renting bees. Who rents bees? There are plenty of them buzzing around the climbing roses on the trellis outside my back door. Jeff owns Sassamanash Farm, a cranberry farm not far from Lake Michigan. He does the farming and I do the baking for the farm store where we sell all sorts of cranberry products—scones, muffins, bread and my own cranberry salsa. I had to laugh because the cake was sitting out in full view on my counter and Jeff had been eyeing it the whole time he was in the kitchen. “So you’ll let the bees out near the bogs?” I said as I cut a generous slice of cake and slid it onto a plate. I had no idea bees could be so particular. “That sounds safe enough,” I said, not knowing that those words would come back to haunt me later. Beekeeping would turn out to be a lot more dangerous than any of us bargained for. To be continued in Dead and Berried, book #3 in the Cranberry Cove series. Peg, I loved Berried Secrets & am looking forward to reading Berry the Hatchet and Dead and Berried! Thank you for this series! I'm so glad you've enjoyed them Sandy! I also need to read this series! Thanks! This is such a wonderful series. 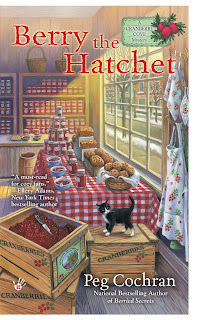 Make sure you pre-order Berry the Hatchet. It is amazing! !